Spring is here, and that means – Spring cleaning! 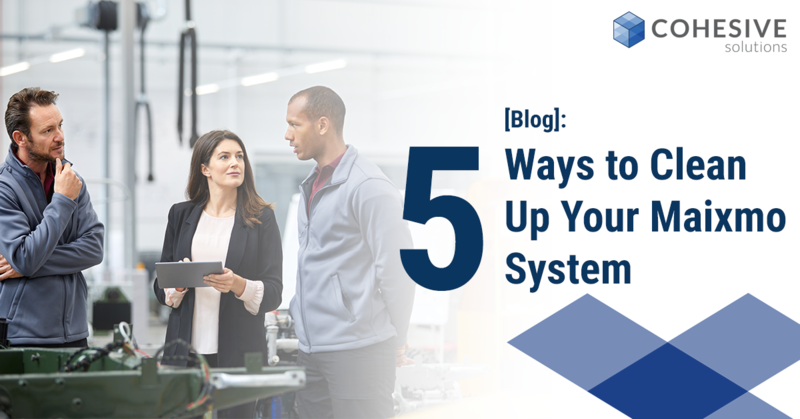 Here are five simple things you can to do clean up your Maximo system and ensure it is running at optimal performance. Are you actively monitoring your license usage? This feature was released with Maximo V7.6.06 and allows you to monitor your usage of Maximo products. This application is helpful to gauge how many licenses you are using, if you are using more than the purchased number of licenses, or if you aren’t utilizing enough of them. This helps prepare for a possible license audit by IBM and ensures your system is clean and accurate in terms of who is using the product. Be sure to review the License Usage Application in V7.6.0.8 as well. This version has two new helpful reports, they are License Usage Summary History and License Usage Detail History. If you aren’t using the new Maximo Work Centers (Work Supervision, Work Execution, and Business Analysis), you should be! These Work Centers are role-based and allow the user to access and complete day to day tasks without the hassle of opening multiple applications – a clean and concise way of staying productive throughout your day, and accurately tracking real-time information from any device. Have you optimized Maximo by integrating your other business systems? Maximo can integrate with other business solutions like GIS, Mobile, Reporting, etc. with their integration framework. This feature comes with a toolkit to help make the process easier and keep data clean and accurate. Integrating Maximo with other systems is an effective way for your users to embrace process changes alongside technology upgrades easily. Is the data in Maximo accurate? Could be time to do a serious health check. One of the causes of data quality issues is in source data that is stored in a collage of operational systems and enterprise applications. Each of these data sources can have scattered or improper values, outdated and duplicate records, and inconsistent (or undefined) data standards and arrangements across customers, products, transactions, financials and more. Data quality difficulties can also arise when an enterprise combines data during a merger or acquisition. But perhaps the most significant contributor to data quality issues is that the data are being entered, edited, maintained, manipulated and reported on by users. Cohesive Solutions is helping companies meet the needs necessary to face the digital transformation. Cohesive provides support system services that connect you instantly to highly knowledgeable individuals who can help your EAM systems, further optimizing your assets and helping you reach operational excellence. There you have it, five areas that need some attention. It is early enough in the year to take a little time to address some critical areas - make 2019 a fantastic year for all your Maximo systems and processes.